Ashington AFC’s newest manager Steve Harmison has been offered support from Premier League neighbours Newcastle United. Following the surprise announcement on Sunday of the former cricket legend taking over the reigns at Ashington, Magpies head coach John Carver has offered his support. Speaking on Monday, Carver said that Harmison was welcome at United’s Benton training ground for a cup of tea and a chat about tactics. The appointment of the former cricketer to take over at the Northern League Division One outfit has got the sporting world talking. Harmison, who is a huge Magpies fan, was born and raised in Ashington and Carver has tipped him to make a success of the role. “I can’t believe he’s gone into management - he must be crazy,” joked Carver, who was recently appointed United head coach until the end of the season. “It’s great though – he’s a north east legend. 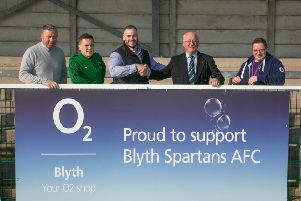 He’s from the town of Ashington, born and bred, and his family have always been connected with non-league football. “He might come in here, have a cup of tea with me and go through some tactics. He’s more than welcome if he wants to do that.